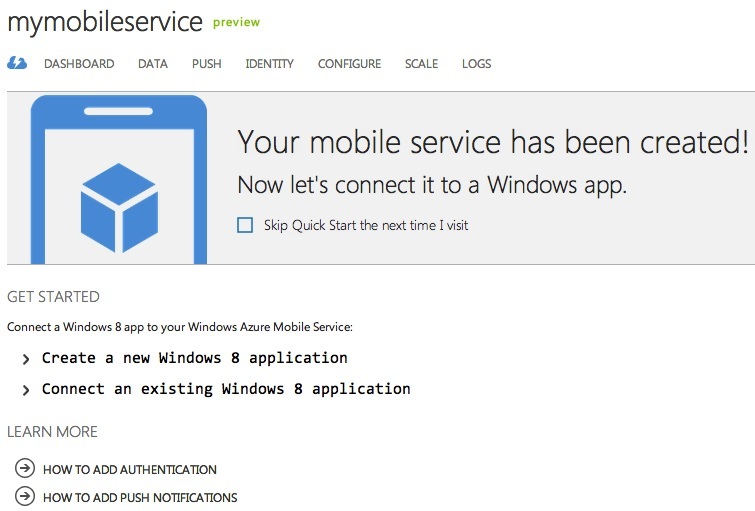 Since this was posted, Microsoft has released the official Android SDK and support for Mobile Services. You can read more about the release and how to use the Android SDK here. 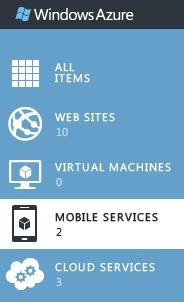 After posting yesterday about connecting Windows Azure Mobile Services and iOS, I had to follow it up with Android! Today, I’m happy to release this walkthrough for connecting Android to Mobile Services. If you read my post from earlier this week on Mobile Services, you’d know that official support for iOS, Android, and Windows Phone 8 is coming. This means that if you want to download and install pre-built REST helper methods for your non-Windows 8 operating system, you’ll have to wait. However, since all of the calls to Mobile Services are being done over HTTP and are REST based, it’s pretty easy to see what each call sends over the wire. This means that we can take that information and write our own code that will run on Android and iOS and hit Mobile Services. Today, I’ll continue showing you how to do just that. 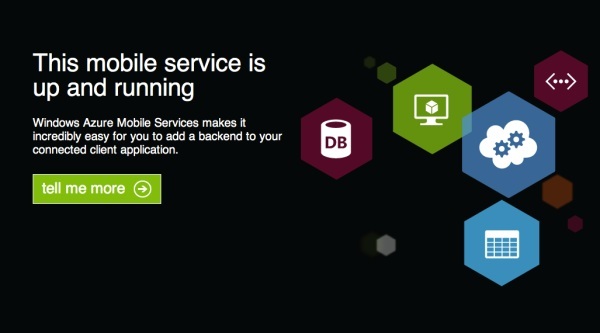 In this article, we’ll walk through creating a new Mobile Service and then connecting an Android client to it. 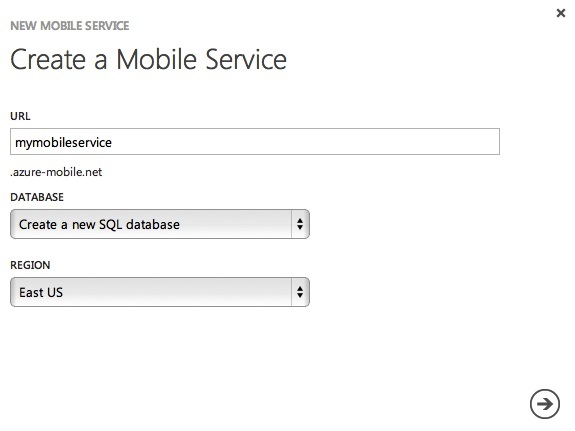 We’ll only use some basic data capabilities provided by Mobile Services but in the coming weeks, I’ll show you how to watch the HTTP calls made by a Windows 8 app (so you can figure out what’s going across the wire) and then how to reproduce some of the more advanced things in both iOS and Android. By the end of this walkthrough, we’ll have reproduced in an Android client, all of the capabilities of the initial Todos Windows 8 Mobile Services demo. You’ll be able to add new todos, list those todos, and mark todos complete. Let’s get started. If you have a computer running Windows 8 as well, I would suggest following the instructions for creating “a new Windows 8 application” seen above. 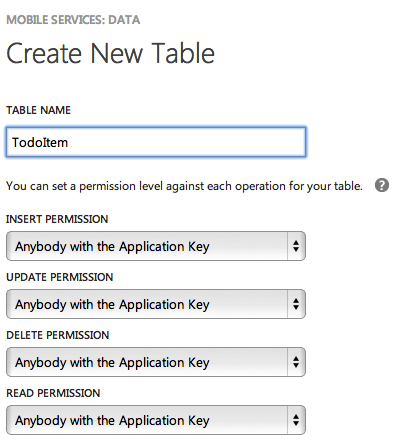 We’ve already created the table, but following those steps will enable you to download a Visual Studio solution that is 100% ready to run and you can see how the basic todos app runs. It’s not necessary for proceeding with the Android client, but it means that you can already have a few todos in your database. Either way, we can proceed to the Android client now. When you’re done, click the Finish button and create your project. Before we start editing our activity, let’s take care of our constants. Right click on your package in Package Explorer and go to New and choose Class. Name the class Constants. 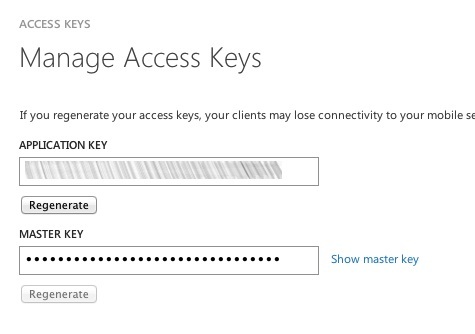 In this class, we’ll add a few variables to hold the URLs we’ll use to access our mobile service as well as the mobile service key mentioned earlier. Make sure you fill in your subdomain and your app ID before proceeding. These URLs follow REST standards and the only interesting thing is the filter query applied at the end of the Get URL. That prevents us from retrieving todos that are already complete. If we take that filter off, we would get all of the todos. Now let’s return to our TodoListActivity.java file. We’re going to change the class that our activity extends from Activity to ListActivity. This activity will just display a list of our todo items. In addition, we’re going to implement a new object we’ll create in a few minutes, ServiceResult.Receiver. Finally, we’ll add a few private variables. Let’s move on to the onCreate method and remove the call to setContentView (this is only used for tying the activity to a layout). After we get rid of that, we can create an instance of our receiver and call a method to start a service to fetch our todos. Here we create a new Intent and reference a TodosFetchService that we’ll write in a few minutes. We’ll pass, as extras, to this intent a reference to our receiver and then start the service. The receiver will be used by the service to call back into our activity and update the UI. In order for it to do so, we need to expose a method for it to call. Specifically, we need to add an onReceiveResult method. All of the constants at the beginning of the class are used for communications between the class that starts the service (TodoListActivity) and the service (we’ve already seen some of them in our activity). We then have a reference to the receiver that is sent over by the activity. In the onHandle Intent method, we tell the receiver that the service is running and then we kick off the fetchTodos method. These variables will keep references to our UI controls, the text and ID of a todo, and a flag indicating if we’re adding a todo or editing an existing one. Next let’s go over the onCreate method. First we set the content view and get references to the UI controls. Next we pull out whether or not it’s a new todo from the intent extras. Depending on this value, we hide fields, set text values, and prevent the EditText from getting focus (so it can’t be edited). Lastly, we add onClickListeners to our buttons. Let’s look at those next, starting with adding a new todo. This is quite a bit of code. First we have the saveTodo method. This is really just a pass through to starting the SaveTodoTask AsyncTask. We first want to look at the doInBackground method of this member class. First, we are putting the data we want to send to the server into a JSONObject. This contains the text of the todo and a complete flag to indicate that it isn’t completed yet. We then generate a HttpURLConnection and set the headers on it (again for Content-Type, ACCEPT, and X-ZUMO-APPLICATION). We write our data to the server and read the response back. If we got a 201 response code, we return “SUCCESS”. Otherwise we return “FAIL” or an error message. The onPostExecute method is called when return is called from doInBackground. Here, if we received a success, we call finish and pass a code of 1 back. If it wasn’t a success, we show a Toast with an error. 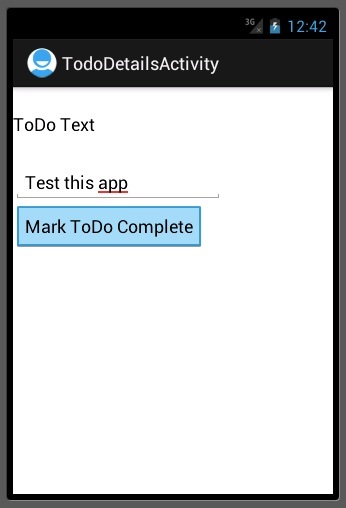 This will get fired when a user taps on a todo item and shows the details view and allows the user to mark an item complete. It will handle creating an Intent tied to the details view, send over details about the todo tapped, and start the intent. Last, and finally, we’ll add the method to handle our menu options and handle the result of the details activity from being run. The options menu is pretty simple. If the user taps refresh, we just restart the fetch todo service. If add todo is tapped, we fire off the details intent and tell it we’re adding a new todo. Lastly, in onActivityResult, if the result code is 1 (which is what is returned by the details activity, we reload the list of todos. That’s it. 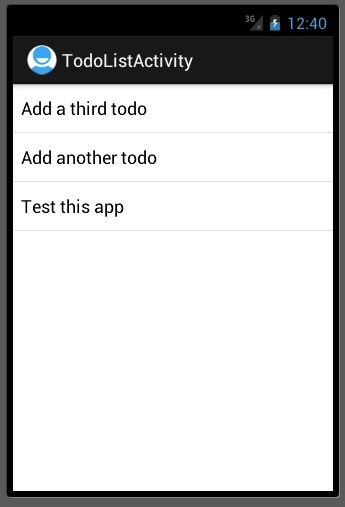 If you run the app, you should now be able to add and mark todos complete. You can access the source code from this walkthrough on GitHub. Just remember that after you’ve pulled it down, you’ll need to change a few things in the Constants.java file. Specifically, you need to enter your subdomain in the three URLs and your app ID in the fourth constants. 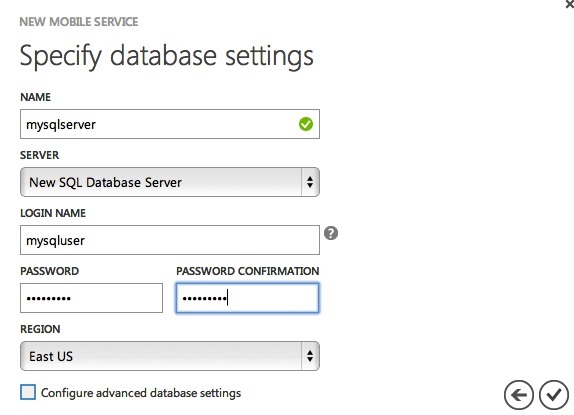 Is it better to use Microsoft Azure SDK than standard HttpClient? You can use HttpClient if you want but then there's a fair amount of work you're going to have to do. One of the tenants of Mobile Services is that you can start building a good experience in your app right away without having to mess around with plumbing. This is one example of that plumbing you don't have to build by using the SDK.